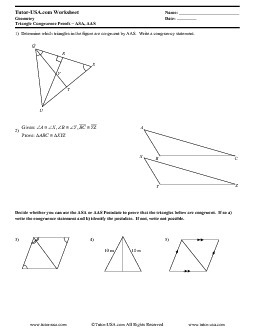 This worksheet contains problems and proofs that involve showing that two triangles are congruent using the ASA and AAS postulates. These proofs also require an understanding of previous properties, definitions, postulates, and theorems such as the segment addition postulate, angle addition postulate, the properties of parallel lines, the reflexive and substutition properties of equality, etc. 2) Write a two column proof. 3-4) Decide whether you can use the ASA or AAS Postulate to prove that the triangles below are congruent. If so a) write the congruence statement and b) identify the postulate. If not, write not possible. 6-8) Write a two Column Proof. 9) Write a Two Column Proof or Paragraph Proof.